Page by Robert W. Lilley -- Visit www.bemorehealthy.com for updates on business, family and fun! Click on the thumbnails to enlarge the pictures. Use your "back" button to return here. 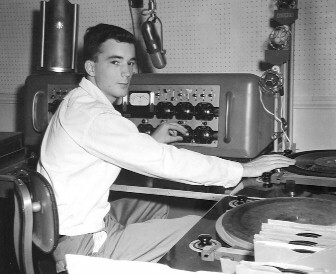 I graduated from South Charleston High School in the Spring of 1959, but not before some wonderful times at Charleston, WV radio stations WGKV-AM, WHMS-AM and finally WKAZ AM/FM. The move from WHMS was not out of dissatisfaction, as I remember it now. 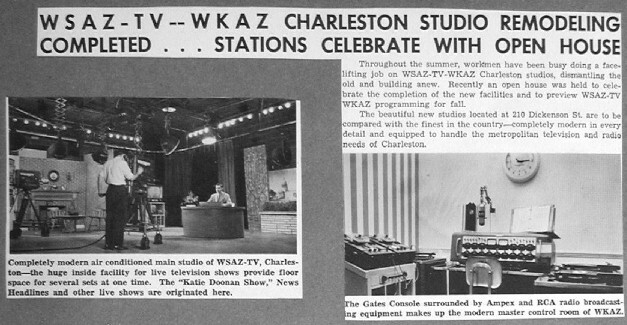 Rather I saw interesting people, equipment and a TV opportunity down the street at WKAZ, since the Charleston studios of Huntington's WSAZ-TV were co-located with WKAZ. I actually did a tiny bit of TV floor-manager duty, and learned a bit about video production and camera work, but it was mostly radio. So, except for a lot of memories of those first jobs, and those good friends, that was the end of the radio career. It was on to electrical engineering and other pursuits. But, I remember a number of people who took a chance on a "green" kid and in the process enriched his growing-up process significantly. About the time I arrived, the station was finishing up a studio rework. Click on the thumbnail to see it better. ...and young RWL moved right in! Always liked those 77DX mikes -- great sound. I presumed to think I needed some publicity shots. A WSAZ-TV photographer (Emil Varney) took the shots you'll see here. Wow, can't believe I was ever that young! You just have to love those old 16" turntables! This was a state-of-the art Gates console, with RCA turntables. Had a couple of small Ampex reel-to-reel tape units off to the left, and a couple Ampex 300-series REEL to REEL (!) units in the room also. I include this shot to emphasize the benefits of renovation! 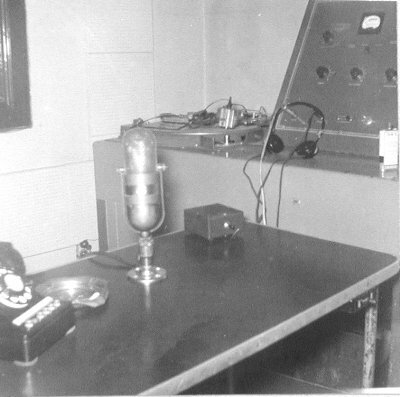 This was the old announce booth. Dial phone, ashtray, cough switch, and in the background, a disk recorder. Yep, it's real, and we used it for cutting spots or voice tracks. Bob Turley would put crazy voices and sound effects on disk for his morning show. 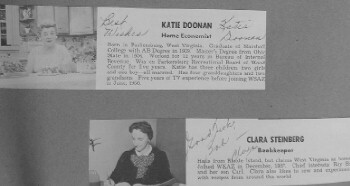 WKAZ staffers - Page 1. Click on the photo to enlarge. 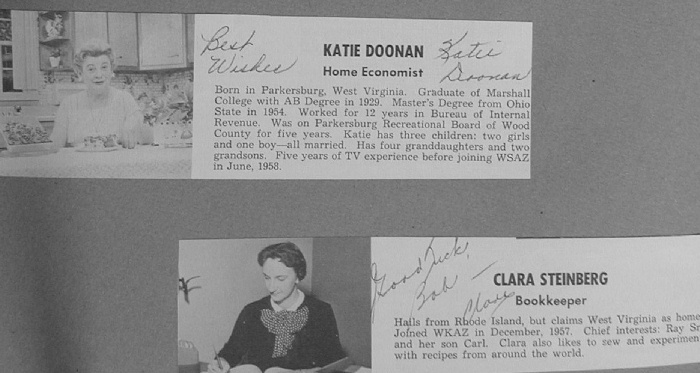 "Katie's Kitchen" was a favorite program, produced at our Charleston studio. Food under hot lights.Everything live. I don't think videotape was a factor at all back then. Maybe kinescopes? ...and Page 2. These people really made the job fun, and they taught me a lot about radio, about people and about what was important. Professionals every one. Just some miscellaneous scrapbook material. 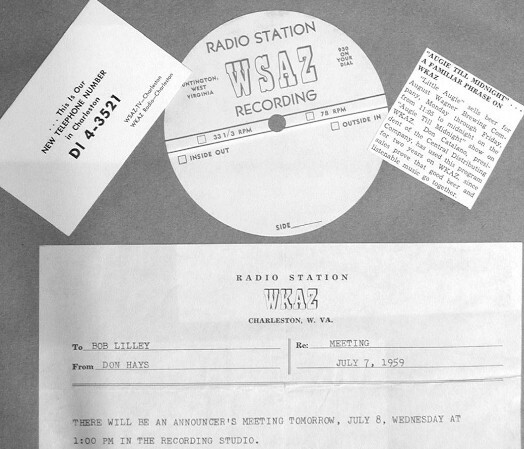 Note the center label for the locally-recorded disks, and its WSAZ logo. I wonder if they had one of those recorders at WSAZ in Huntington also, or if they "transferred" it to us? Another one of Varney's publicity shots, just to prove they would let me get that close to an image orthicon camera.